What are the methods of sampling? 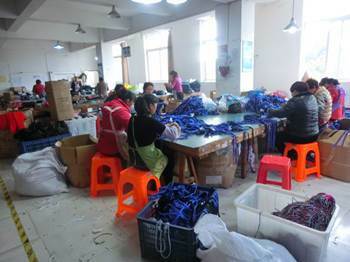 All the retailers want to buy high quality products from manufacturers, to sell the product to their customers, so we need to follow various methods of inspection techniques, depends on the customers wants and needs.when the inspector controls the quality of your shipment from China or Asia, how would you like him to help for you? how many pieces of garment been sampling and checked? Sampling methods are used to determine how we will choose the batch to be checked. Usually, an inspector only checks a part of the whole. A portion should be enough in order to determine the quality of the items to be delivered. Which sampling method should you use for your production? Example below for sampling methods in garment industry, the main purpose of inspection is to know about the lot of garments to be granted or rejected. How many sample would be collected from a lot will be the aim of sampling plan. Also informed that, if more sample would be inspected needs more time and cost. 100% inspection also calls full inspection, means every unit must be inspected. In this method, it is decided about that every pieces of garment would be granted or rejected instead the lot of garments to be granted or reject ted. It can have an idea about the quality of garments by this sampling method. It is also informed that, all the defects are identified by 100% inspection. Also informed that, if 100% inspections is done then needs more time and cost. This is the middle position of 100% inspections and no inspection methods. The goods which are made for shipment are inspected randomly. In this method, the result is found minimum. some customer also choose it for check the raw materials, semi-finished products or container loading inspection. This type of method is most popular and widely used in apparel manufacturing sector. Whatever the lot size available is, 10% sample of the lot is collected and inspected and will decide the lot of garments to be granted or rejected. Both the advantages and disadvantages are found by applying this method. In this AQL sampling method, samples are collected and inspected by statistically from the lot size and will decide the lot of garments to be granted or rejected. This plan is used for inspection of raw materials before garments production, during production period, and for finished garments after production(final inspection). This sampling method is widely used and internationally recognized and accepted. also the most popular method in any third party inspection company, Most useful advantage of this method is controllable and minimum risk of accepting wrong decision. and this method for inspection also more practical and economical. How AQI Service can help you? We offer a rigorous and complete training to the inspectors we recruit by providing them quality control related courses and examinations. We also ensure that they pass the tests so that they are able to perform inspections and understand the different points to verify. Our trained quality inspectors identifies and records the non-compliance report, and look for performance improvements. We can advise and help you at the different stages of your production, from raw materials to pre-shipment.